Grand Central Publishing, 9781455537266, 288pp. 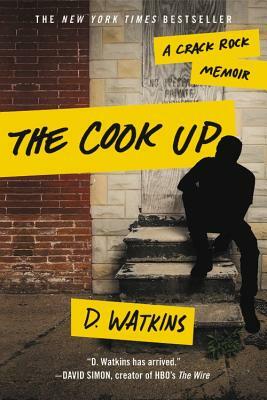 Told by the man who lived it, The Cook Up is a riveting look inside the Baltimore drug trade as portrayed in the hit HBO series, The Wire. The smartest kid on his block in East Baltimore, D. was certain he would escape the life of drugs, decadence, and violence that had surrounded him since birth. But when his brother Devin is shot-only days after D. receives notice that he's been accepted into Georgetown University-the plans for his life are exploded, and he takes up the mantel of his brother's crack empire. D. succeeds in cultivating the family business, but when he meets a woman unlike any he's known before, his priorities are once more put into question. Equally terrifying and hilarious, inspiring and heartbreaking, D.'s story offers a rare glimpse into the mentality of a person who has escaped many hells. D. Watkins is a columnist for Salon. His work has been published in the New York Times, Guardian, Rolling Stone, and other publications. He holds a master's in Education from Johns Hopkins University and an MFA in Creative Writing from the University of Baltimore. He is a college professor at the University of Baltimore and founder of the BMORE Writers Project. Watkins has been the recipient of numerous awards including Ford's Men of Courage and a BME Fellowship. Watkins is from and lives in East Baltimore. He is the author of The Beast Side: Living (and Dying) While Black in America.